Join Ray McGovern in New York on Saturday, November 22! Several impressive developments over the last 18 months have lifted the 9/11 truth message into the mainstream news and public awareness. These developments include the Rethink911 campaign, CNN's coverage of the alternative 9/11 Museum Guide and outreach effort, Richard Gage's interview on C-SPAN, the debut of The Anatomy of a Great Deception, and the huge video billboard in Times Square depicting the collapse of World Trade Center Building 7. Now there's a new opportunity that holds great promise. On September 9, Rep. Jones and several congressional cosponsors, along with 9/11 family members, held a press conference at the National Press Club to promote H.R. 428's passage. Currently the legislation has 20 co-sponsors and growing support from 9/11 families. In addition, some members of the 9/11 Commission are on record calling for the pages' release. The bill's cosponsors say their views on the 9/11 attacks changed after reading the 28 pages. Rep. Jones, for example, declared that "[the 28-redacted pages do] not deal with national security per se" but are "more about relationships. The information is critical to our foreign policy moving forward and should thus be available to the American people. If the 9/11 hijackers had outside help — particularly from one or more foreign governments — the press and the public have a right to know what our government has or has not done to bring justice to the perpetrators." The release of the 28 pages will bring new attention to the events and consequences of 9/11, including the destruction of the three WTC skyscrapers, which is AE911Truth's focus. For more information, see this website with its comprehensive overview of this issue online. It contains an explanation of the significance of H.R. 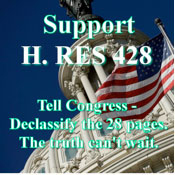 428 as well as detailed steps that seekers of 9/11 truth and justice can take. Our ongoing political actions will help ensure passage of the resolution. See the "Take Action" section of HR428.org for instructions, sample letters, and an automated function that delivers your letters directly to your member of Congress. Please review this material today, then do whatever you can to take this issue viral through your social networks and your personal and organizational contacts. Ray McGovern, retired CIA analyst; co-founder of Veteran Intelligence Professionals For Sanity. Topic: "The Surveillance Pseudo-State — Release the 28 Pages"
Ramsey Clark, U.S. Attorney General (1967-69); founder, International Action Center. Topic: "Global War is Over — If You Want It"
Jeffrey Steinberg, senior editor, Executive Intelligence Review. Topic: "The Erinyes Principal: The BRICS Nations Revive JFK's New Frontier"